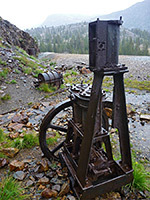 Most of the famous mining areas in the Sierra Nevada are on the west side of the range, at relatively low elevations, but some are also found high up to the east, near the mountain crest, such as one at the eastern edge of Yosemite National Park just north of the Tioga Pass. 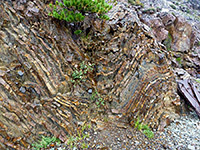 Great Sierra Mine near the Gaylor Lakes lies just within the park boundary, while other mines in the vicinity include May Lundy on the slopes of Mount Scowden, and Bennettsville (also spelt Bennettville), in the westernmost of the two valleys draining into Ellery Lake. This latter may be reached by an easy trail of just over a mile that passes ponds and patches of woodland and leads to the entrance of the main adit, now securely sealed. 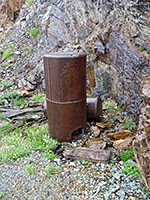 Mine relics include the remains of a handheld drill, two pressure tanks and two pumps, plus spoil heaps and wooden fragments and also, on the valley floor, several structures from the accompanying settlement of Bennettsville. Also here are two replica wooden cabins. Past the mine entrance, the path continues another 0.3 miles to the end of narrow Shell Lake. So although short, the trail encounters varied surroundings, always within sight of high, treeless summits in all directions. The path sees relatively few hikers however, partly since the trailhead is not marked. 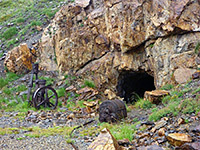 The mine produced only a small amount of gold and silver ore before its closure in 1884; a second brief period of activity, in 1933, was also unsuccessful. The place is named after Thomas Bennett, manager of the local mining company. 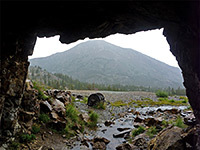 There are two possible start points for the hike to Bennettsville Mine - one is at a wide pullout by the turn off to Tioga Lake Campground, the other a smaller layby 0.4 miles south. These two points are linked by a long disused but formally paved wagon road; the path forks off towards the southern end. 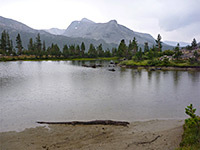 This area is just east of the Yosemite National Park entrance station at Tioga Pass, and is usually accessible between June and November. Bennettsville townsite may also be reached by a 0.7 mile path from the Junction Campground. Bare, reddish rocks tower above the trail to the west, but most of the route is somewhat overgrown, with bushes and patches of trees, interspersed by some open clearings. The path passes three shallow ponds on the right, whose banks are home to a good selection of summer wildflowers, and enters a brief thicker stretch of trees. 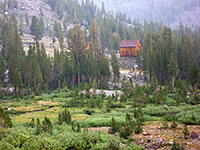 Views along this initial section are impressive, south and east across the Tioga Pass area to the smooth slopes of Mount Gibbs and Mount Dana. The ground rises slightly to a saddle then slopes down, at the edge of the valley of Mine Creek - ahead the land is mostly unvegetated, except for a line of trees around the stream. The mine site comes into view to the west, 100 feet above the valley floor, and is easily recognisable on account of the large adit at the base of a line of low cliffs, and the extensive, spreading piles of excavated, orange/pink rocks below. During wet weather a stream flows out the adit, partly fed by shafts through the hills above, and lined by numerous yellow monkey flowers. 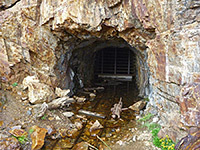 A few yards of narrow gorge railway tracks remain in front of the tunnel, extending far underground, though only about 30 feet of the passage is accessible, up to a sturdy iron gate. 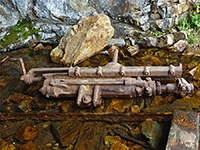 The other main metal relics are a steam pump, a compressed air pump, two pressure tanks, and the remains of a handheld drill. Two wooden cabins, and a few other remnants from Bennettsville, are 1,000 feet away, a short distance up the slope on the far side of the valley. Past the mine entrance, the trail continues 0.3 miles to the lower end of Shell Lake; the larger Fantail Lake is 0.7 miles further.